The Amazonas Park is a private zoo in the north east of the island of Crete. The focus of the zoo is on animals from South America, especially parrots and monkeys. There are also some domestic animals like donkeys and goats. The Amazonas Park was opened in 2011. Since then, he has been enjoying increasing popularity. During the season several hundred visitors arrive daily at the animal park. Also some companies offering day trips by bus have included the largest zoo in Crete in their program. The parking lot opposite the entrance is often filled in summer. The zoo is near the small town of Neapoli, major tourist resorts like Chersonissos, Malia and Agios Nikolaos are all less than 30 kilometers away. What to see in the Amazonas Park? In many aviaries (large bird enclosures) you can see parrots from Latin America and cockatoos from Australia. One aviary in the Amazonas Park is particularly big, here are the larger parrot species. In several parts of the zoo are monkeys, most from Latin America and Madagascar. Probably the largest attraction in the Amazonas Park is a very large enclosure with monkeys and goats. Visitors of the zoo can walk in. One monkey species are the well-known monkeys from Gibraltar (barbary apes). They behave relatively quietly. The other smaller monkeys are very active. They jump on the shoulders of the visitors. If another person is nearby, they jump from person to person. They are fed by a nice and informative animal keeper with banana. Especially kids love the donkeys in the Amazonas Zoo. Also the plants in the Amazonas Park, like palm trees and flowers, are beautiful and interesting. What is the purpose of the Amazonas Park? The main function is the rearing and reproduction of rare species (especially parrots), which are threatened with extinction. For many of these birds the warm climate in Crete is ideal. In addition, most parrots live in South America in the mountains. The Amazonas Park on the island Crete is 500 meters above the sea. Many parrots in the zoo come from an animal park in Switzerland. The climate in the south of Greece is much better for birds from the tropics than in Central Europe. Some rare parrots have already been released in their homelands after their reproduction in the Amazonas Park on Crete. The large breeding station of the birds in the Amazon Park can not be entered by the visitors of the zoo, for obvious reasons. We think, despite the up to 10 Euro entrance (see below), yes. It is the only zoo in Crete. The Amazonas Park is very clean and well-kept. The staff is very nice and answers any question. 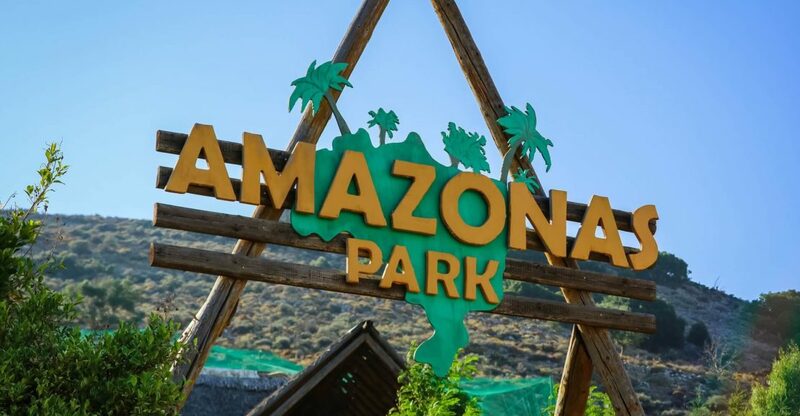 The owner, a young man from Luxembourg with Portuguese descent, has built the Amazonas Park without any help from the government of Greece. He wants to save species from South America on Crete from extinction. By car: Take the Neapoli exit on the Heraklion – Chersonissos – Malia – Agios Nikolaos expressway. Do not enter the small town of Neapoli. Take the other way up the hill towards Kourounes (a small village). After about 3 kilometers you reach the zoo. It is relatively easy to find the zoo, since the Amazon Park is well signposted at every important junction in the area (also at the exit of the expressway). With a tour: From the large tourist resorts on Crete there are more and more bus tours to the Amazonas Park in Kourounes near Neapoli. You can ask in one of the many small travel agencies on Crete.